At the dawn of the Rocket Age, science fiction author Arthur C. Clarke, among others, imagined a satellite orbit with a period identical to Earth's rotational period. They had imagined that with such an orbit, the satellite would not appear to move with respect to the Earth's surface, providing constant radio communication over nearly half of the Earth's surface at once. What they had originally imagined was a total of three satellites, 120 degrees apart, orbiting directly over the Earth's equator. Today, the Geostationary (GEO) orbit is the most important orbit type for worldwide communications. The Space Shuttle relies on this orbit to maintain its communications with the Earth. When you turn on your TV, it is most likely that you are relying on geostationary satellites! Live international reporting owes its very existence to geostationary satellites. The geostationary orbit is circular, has a period of 23 hours, 56 minutes and 4 seconds and is situated directly over the Earth's equator at all times. Some might have heard of the term "Geosynchronous" to describe this type of orbit. A "geosynchronous" orbit also has a one day period but it differs from the geostationary orbit in that the orbit need not be circular or directly above the equator at all times. A geostationary orbit is one specific example of a geosynchronous orbit, but not vice-versa. The Tundra orbit is another specific example of a geosynchronous orbit. So far, Sirius Satellite Radio is the only company to utilize this type of orbit, however, it might represent the future of geosynchronous communications. The Geostationary Belt is a belt of satellites orbiting about 36,000 kilometres above the Earth's surface. 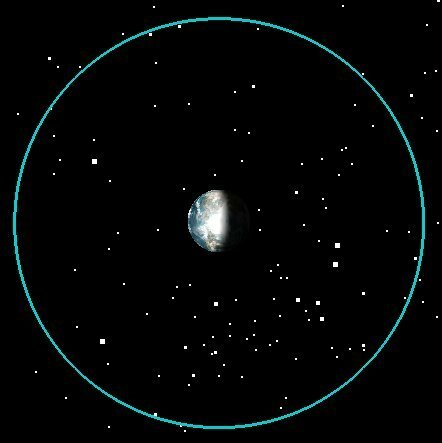 Here we see the orbit of the Canadian Telesat Anik F3 telecommunications satellite as seen from above the Earth's northern pole. This image courtesy of Analytical Graphics Inc. (AGI).